Whether you're hoping to save money by detailing your car or want to make sure your professional auto detailing goes smoothly, it can help to keep a few important tips in mind. There's a lot to think about when it comes to thoroughly cleaning your car's interior and exterior. However, with the right products, tools, and techniques, you can have your car looking brand new again in a matter of a few hours. No matter how tidy you are, your car's interior will eventually need a thorough cleaning. Over time, you'll end up with stains on the upholstery, grime in the crevices of your dashboard, and things you probably don't even want to think about wedged under your seats. A good cleaning will help you get that new-car feeling back. Keep these tips in mind. To clean your car's interior, assemble the right tools: a vacuum, a toothbrush, some mild cleaner, a stiff carpet brush, a paintbrush, glass cleaner, paper towels, and some lint-free cloths. Having these supplies on hand will help. After you've vacuumed up as much dirt as you can from the carpet and upholstery, gently brush the carpet with a stiff brush. Be careful not to disturb the carpet fibers too much, since they can be very delicate. Then vacuum the areas again. Use a paintbrush and toothbrush to get into hard-to-reach crevices before you clean other surfaces in the car. This keeps the grime from being compacted in these areas and makes it easier to wipe it away. If there are spots on your car's upholstery, mix up a solution of warm water and baking soda. This helps neutralize the stain, and may absorb any odor that is coming from the spot. Be sure to wash it off thoroughly. Always test the products you use to clean your car. Since some car interior materials are very sensitive to chemicals, apply the cleaner in an unobtrusive spot first. Use great care with the cover of the car's instrument panel and the display for the stereo. After deep cleaning your car's upholstery and carpet, be sure to rinse everything thoroughly. If you leave excess cleaning solution in the fabric, it will attract dirt. Also pre-treat any stains to make removal easier. If you have leather upholstery, consider using a pH-balanced leather-cleaning product like Zymol Z507 or Lexol. Leather is a natural material, and while it is tough and resistant to tears, it does need to be cared for with gentle cleaning products. Your car's exterior also takes a lot of abuse. From road salt to sunlight, a variety of substances and situations can lead to dull paint, scratches, and stains. Keep these tips in mind to get professional results at home. When cleaning your car's exterior, you should park it in a shady spot, and wait for it to cool off from any recent drives. 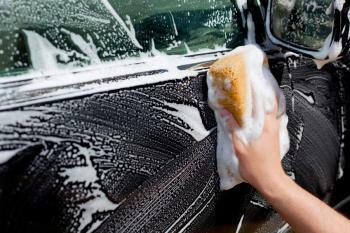 If your car is hot when you wash it, the soapy water will evaporate from its surface, leaving white soap spots on the paint. When cleaning your car's exterior, start with the wheels and wheel wells. This is the dirtiest area of the car, so it's best to keep the mud from splashing up onto the rest of the vehicle. After the wheel area is clean, continue cleaning the car from the top down. If you're planning to clean your car's engine compartment, it's also a good idea to do this area first. Use a soft toothbrush and some wheel cleaner to detail your car's rims. It can be difficult to remove the brake dust that accumulates on the wheels, but this step will really improve the appearance of your vehicle. Use a clay bar, which you can buy at auto supply shops like AutoGeek.net or Chemical Guys, to remove impurities that remain on your car's clear coat after washing. Clay bars can help you minimize scratches, remove industrial pollution, and get rid of other imperfections. Follow the directions on the clay bar kit. After you've finished washing the exterior of your car, be sure to dry it off right away to avoid water spots. Use a clean rag or chamois, and work from top to bottom. When waxing your car, choose a product designed for at-home use. Some professional car waxes require special tools. If you're planning to hire someone to detail your car, make sure you get the most for your money. Be sure to do your research, and ask lots of questions before signing up for a detailing package. As you choose your provider, keep the following tips in mind. Your auto detailer should be able to provide you with the names of a few of their previous clients. Your vehicle is a major investment, especially if you own a sports car, one-of-a-kind classic, or luxury automobile. Remove all valuables from your car before detailing. Even though most people are honest, it pays to err on the safe side when it comes to valuable items. Removing extraneous sports gear and equipment from your car can also help the detailing process go more quickly. Get a detailed estimate of the services that will be performed, and agree to a set price. You don't want to be surprised by a large bill for services you unintentionally added to the basic detailing package. 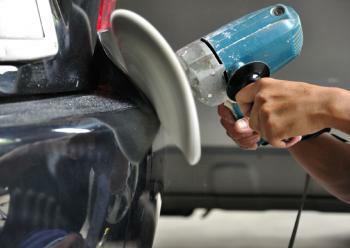 Make sure you advise the auto detailing service provider about any problem areas or places of concern in your vehicle. This way, the detailer can pay special attention to spills on the upholstery or scuffs on the paint. Cleaning your vehicle does more than give you pride in your ride. It also helps prevent wear and tear on your car's interior and exterior surfaces. Built-up grime can get ground into these areas, causing permanent damage. Frequent cleanings are an important part of car maintenance. In the spring - Winter snow and road salt can cause damage to your vehicle. 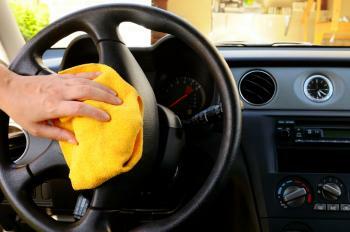 Give your car a thorough cleaning inside and out once the weather gets warm. After a trip - Road trips often result in a mess. Even after you throw out the empty coffee cups and fast food wrappers, your car may still feel dirty. A good detailing will get rid of any lingering odors or stains. Before a big event - Whether you're taking your car on a special date or using it to transport relatives from out of town, it will look a lot more impressive if it's really clean. 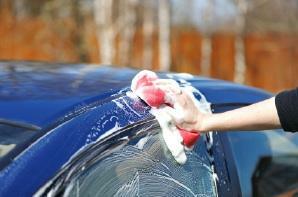 Before you sell - If you're planning to sell your car or trade it in at the dealer, thoroughly cleaning it beforehand can increase its perceived value. Thoroughly cleaning or detailing your car can take several hours, so it's a good idea to minimize heavy-duty cleaning sessions. You can keep your car looking nice by wiping up any spills or smears as soon as you notice them and vacuuming the interior frequently. Also, make use of touch-free car washes as often as possible to keep the exterior clean and shiny. This regular maintenance will help ensure that your car looks as good as new for years to come.